Captain Henry Woods of the Muskegon Life Saving Station built innovative machinery and wrestled mariners from the grip of Lake Michigan storms. Captain Henry J. Woods, keeper of the United States Life Saving Station at Muskegon, Michigan, for 16 years, considered the resue of the schooner Donaldson one of the most thrilling episodes of his career. On March 29, 1882, Captain Woods and his surf men rescued the crew of the S.B. Pomeroy and helped saved the schooner. Later that year, they rescued the crew of The Donaldson, a three- masted schooner, measuring 420 tons, and valued at $20,000. Built at Tonawanda, New York by J. Martell in 1866, the Donaldson was the property of the Donaldson Brothers of Buffalo, New York, and considered one of the finest vessels on the Great Lakes at the time. A fierce storm lashed Lake Michigan on November 28, 1882, and a look out from the Life Saving Station spotted the schooner Donaldson, dismasted, but still afloat. They couldn’t get a tug so they pulled out a life boat. The crew lashed themselves to the thwarts so they wouldn’t be lashed overboard, and Captain Woods and his men guided the lifeboat through a blinding snowstorm and heavy seas. They finally reached the Donaldson, which lay seven miles out in Lake Michigan and sixteen miles north of the station. Captain Robert Young and his crew climbed into the lifeboat and after a twelve hour trip, the Donaldson crew and Captain Woods and his life saving crew finally reached the lighthouse, drenched to the skin and covered with ice. Captain Robert Young and the crew remained at the light house, while the mate, Mr. Cameron sent a telegram to Chicago, asking for a tug and line. He set off for Chicago by train the morning after the rescue and planned to return to Muskegon and the stranded schooner aboard the tug. The Donaldson was believed to be salvageable. A clipping in the J.W. Hall Great Lakes Marine Scrapbook No. 2, dated November 1882, reported that there were hopes of saving the Donaldson if the weather moderated for a few days. It also noted that the Chicago Grain Insurance Pool had not yet had a serious loss in the 1882 season, something that had never before happened in the history of Great Lakes navigation. The Donaldson, in fact, proved to be salvageable. She was repaired and remained in service until August 17, 1913, when another Great Lakes storm threatened her, this time a Lake Erie gale outside of Cleveland Harbor. The Donaldson began to leak heavily, and she sank into Lake Erie near the Cleveland harbor entrance. This time she was considered too old to salvage, so she was left to rest on the bottom of Lake Erie. The Donaldson rescue was not the only time that Captain Woods and his crew pulled stranded mariners from a watery or frozen death. A list of the ships and crews that he and his Life Saving Crew at Muskegon rescued included the steamer Michael Grohand and 14 men and the schooner Trial and three men. They also saved many people in Muskegon Lake, including two sailboats and six people, the yacht Viking and four men, and the life of a boy that Captain Woods found floating under the water. The United States government appointed Captain Henry J. Woods as keeper of the light house station at the federal exhibition in the Cotton Centennial Exposition at New Orleans in 1885-1886. The United States Building where the Federal Government and several of the states had their exhibits was 885 x 565 feet. 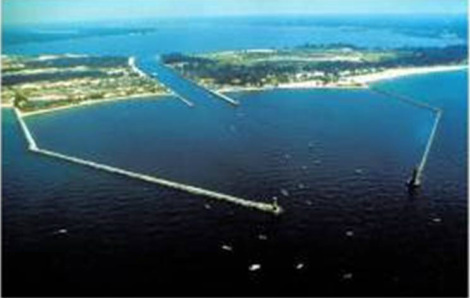 Contemporary reports said that Captain Woods and his crew kept the lighthouse station well. Besides his light keeping and live saving duties, Captain Woods put his considerable mechanical ability to practical use. He invented several items to enhance life saving efforts, including a system of carriages to carry and launch the large lifeboats that all life saving stations used. He fashioned and patented oar locks and steering oar locks that life saving officials valued so highly that they authorized him to build some for government use. He fitted up a machine shop next to the Muskegon Light at his own expense and supplied it with $1,000 worth of tools. It is possible that Captain Woods became enamored of machinery while he ran a stationary engine in the oil country near Erie, Pennsylvania, for he had enjoyed a life full of adventure before he arrived at the Muskegon Light House. Born near Oneida, New York, on May 29, 1850, Henry J. Woods attended the district schools until he turned 14 years old. In 1864, he went to Murfreesboro, Tennessee, where his brother-in-law Captain Frank Jackson commanded the Twelfth Ohio Independent Battery of Artillery in the Civil War. Although he wasn’t an enlisted soldier, Henry fought in the Battle of Murfreesboro and when the battery was transferred to Chattanooga, he went along with it and stayed there until the end of the war. After the Civil War, Henry worked as a boatman and fisherman in Erie, Pennsylvania, and in 1868, he started out in business for himself with two boats, fishing along Lake Erie’s shore from Erie to Fairport, Ohio. In 1875, he went to St. Joseph, Michigan, and in 1876 returned to Pennsylvania where he spent three years in the oil fields. He returned to St. Joseph in 1879 and in the spring of 1880, he entered the lifesaving station at St. Joseph, Michigan as surf man No. 1. He stayed at the St. Joseph Station for two seasons and played an important part in rescuing men and vessels in distress. On February 6, 1881, at Grand Rapids, Michigan, Captain Henry J. Woods married Hulda A. Wells of Marietta, Ohio. They had two daughters, Hattie H. and Gracie B. An item in the St. Joseph, Michigan Herald dated December 4, 1886, describes the next career move of Captain Henry J. Woods. The Herald noted that since the St. Joseph Life Saving crew was established, five keepers of stations had been appointed from its crew and were stationed as follows: Henry J. Woods, Muskegon; Jas. Flynn, Grand Point au Sable; Chas. Lysaight, North Manitou Island; Charles Morton, Holland; and John Lysaight, Racine, Wisconsin. In 1882, the Lighthouse Service appointed Captain Henry Woods keeper of the Muskegon Light Station. His biography in History of the Great Lakes notes that his wife Hulda, and daughters made the inside of their lighthouse home as safe and snug as Captain Henry J. Woods did on the outside. Berger, Todd R., Lighthouses of the Great Lakes: Your Ultimate Guide to the Regions Historical Lighthouses, Voyageur Press, 2002.